Floods are the second biggest culprits next to accidents in destroying cars every year. Last year, flooding caused by hurricane Harvey which struck parts of United States damaged close to 500,000 vehicles including numerous pricey exotics. More recently, typhoon Jebi made its way to Japan last week, causing carnage in the Rokko Island. Among all the car dealerships that got flooded, a Ferrari showroom was probably the most unfortunate of them all. 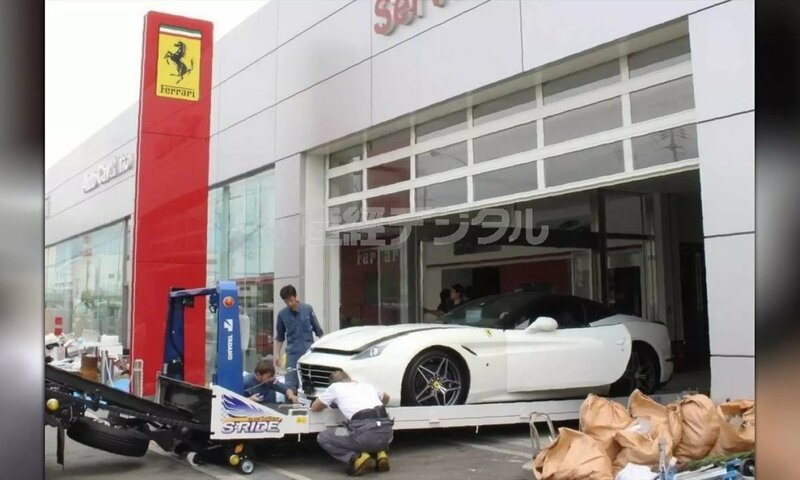 Yahoo Japan reports that the typhoon destroyed 51 of the 53 Ferraris housed at the dealership, many of which were customer cars. Employees at the facility attempted to stop the water with tarps and sandbags but were unsuccessful in keeping the cars from getting submerged. The cars were declared total losses and trucked away to be scrapped. The owners of the facility which opened in 2016 as the first official dealership in the region estimate losses of around a billion yen or $8.9 million. A part of this would be recovered through insurance claims. In any case, business has been severely affected and it would be a while until the dealership recovers. With 130 mph winds, typhoon Jebi is being considered to be the strongest typhoon to strike Japan since typhoon Yancy in 1993. It has already claimed lives of at least 11 people and has made tens of thousands to evacuate.